2 - A button will appear on your landing page. 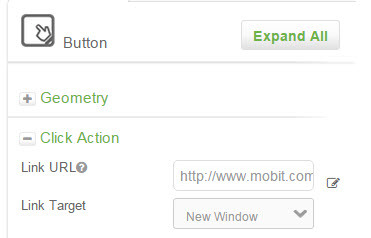 Customize your button from the properties section to the left of your landing page. Make sure your button is selected or else the properties section will appear empty. 3 - To add a link to your button, expand the Click Action section and paste your URL in the Link URL text field. URL for a web link must begin with http:// - NOTE: If you are linking your button internally to another MOBIT page, make sure to a use the Page Link URL, not Mbitly URL. You can also insert Merge Fields on the end of your link by clicking the icon to the right of the Link URL section.